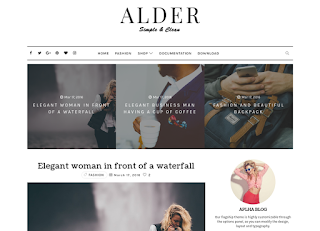 Alder Clean Blogger Template is a responsive, modern, simple and easy to use of the blogger Blog template. Alder Blogger template is an perfect choice for lifestyle bloggers, travelers, cooks, writers, photographers and those who want to create a beautiful and clean blog. It has a minimalistic layout that focuses on simplicity and readability. Crafted on a foundation of solid coding and bolstered with plentiful color, background, and general blogger customization option. It comes with nice typography by default and also you can use custom typography too in this template. Very suitable for writers and everyone who like writing or blogging. Alder is supported by the Blogger template Customizer, you can quickly and easily change the color combination of your blog. Alder comes with some of the best features like Stlylish Featured Post Carousel, Minimal Popular Post, Multilevel Dropdown Menu menu, Email Subscription, instagram widget and many more.